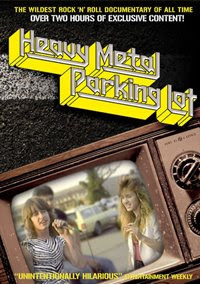 I'll be honest: I never saw Heavy Metal Parking Lot before it was released on DVD. I've never been big on bootleg tape trading and I'm not a Judas Priest fan, so maybe that explains part of it. But a little bit of me feels like a rock know-nothing for not having known about this underground semi-phenomenon. I'm not going to dwell on it, but I just wanted to put that out there. The 20th anniversary DVD release of this short documentary (shot pre-show in the parking lot of a Judas Priest concert in Landover, Maryland in 1986) is about as deluxe as it gets. Not only is there a pristine-as-possible restoration of the original 17-minute film, but you can even watch it in a recreation of what a heavily dubbed copy would look like. I actually think that's quite brilliant. There are also collections of tributes to the film, a great segment where they catch up with a few of the people who were in the flick, and some other geeky extras. But, my favorite part of this DVD is tucked away in the bonus features and only pertains to the film via a loose Priest connection. It's the "Heavy Metal Basement" mini-doc, and it will thrill any record collecting nerd to no end. They go into this dude's basement, he pulls out this huge stack of Judas Priest records, and explains what each one is and where it came from. Like I said, I don't even like Judas Priest, but I've watched this segment three times in the past couple o' years and I still love it. Dude also shows off ticket stubs, t-shirts, bootleg vids, and other random items that only a superfan could treasure. It's shakily shot and hastily edited, but it's fantastic. If you've never seen HMPL, it's worth a Netflix, at least for Zebra Man.